If Peter Cain were still alive, his paintings of cars would be points plotted on the continuing arc of his life. As things are, the power of that arc was cut at the source, and the connections and interactions of his thought lie static, but available to a different kind of scrutiny. As a body of work the car paintings feel both more and less bounded with the passing of time. Their originality and self-sufficiency are certainly clearer. In a relatively brief period, on a steep learning curve, Peter took an idea of questionable promise and drove it hard. From a self-aware variant of illustration close to the wry and bright observations of Ed Ruscha, but with a formalist punch line, the paintings grew to something more tragic and disturbing, coming closer in spirit to the work of someone like Mark Rothko: grand and terrible, yet summoned out of the mundane. Peter went from clever to deep. As the current of painting's dependency on photography with its implications for representational strategies continues to deepen, Peter's paintings appear more and more prophetic (and critical). He aspired to a monumentality that is rare in painting right now, and for all the apparent chilliness of these pictures there is no irony; he wasn't in the background winking as he made these things. There was a weird dictatorship of formal principles at work as the construction of the car paintings developed. The subjects couldn't exist in the world, only in the two dimensions of painting, supported by a matrix of orientations, edges, and fields. They conjure the musings of dystopian science fiction, of a world of machines designing them-selves. The automobiles have taken over their own research and development, raising the stakes of their morphology beyond the lowly needs of humans. It's a strange commentary on "pure" design. The cars in the last of these paintings resemble robots, or bombs. When Peter died we were still firmly settled in the twentieth century; five years later we perch uneasily on the brink of the twenty-first. It's possible that the automobile as a cultural icon doesn't have the resonance it once did. Certainly the shattered village life, collapsed distances, and homogenized landscapes that "car culture" has given us have become ubiquitous, and not even disturbing to many of us. The social medium within which the paintings function has altered its composition, so the libidinous and class-based aspects of cars are perhaps less easily isolated. It's doubtful that Peter worried much about any of this as he followed the implacable logic of his paintings' transformative axioms, but these networks of thought extend out from the images nonetheless. When he died it felt necessary to consider his entire output, to try to comprehend it as a life with an end. At the time one couldn't be sure how much staying power any of it might have in the life of our minds. But the interval has been good to Peter's work, at least in the life of my mind. As their point of origin recedes the car paintings ride with us, their admixture of intention, affect, and reference completing and expanding them in fresh new ways. They operate topically and generally, in recent and deep time, like totemic objects that embody truths about the moment they were made and reach beyond to the realm of archetype. Peter Cain died on January 5, 1997, at the age of thirty-seven. He had a cerebral hemorrhage in his sleep, lingered in a coma for a few days, and was gone. His work was widely seen but not too widely known. He’d had five one-person exhibitions in New York and California since 1990. He was in the 1993 and 1995 Whitney Biennials, so he had “respect,” and a lot of warm bodies had passed in front of his work, but his serious audience remained small—small enough that we mostly knew who each other were. His paintings and drawings are odd and special, and they’ve always polarized people. An occasional bonus of following art is the experience of having your mind changed by something you’ve seen without your conscious involvement. When I first saw Peter’s paintings turning up in group shows in 1989, they seemed too precise and mechanical to be connected to anyone’s inner life, and I filed them away as part of the “consumer art” discourse that was in the air then. But for some reason, I found myself gradually thinking about them in another way, as a kind of abstraction. The cars started to feel like vehicles for thought; the compression, inversion, and distortion charged the images with a claustrophobic grandeur, and I remembered an end-of-the-world kind of light. I found myself referring to these encouraging examples of new painting. When I met Peter in 1990, he was living in a tenement apartment with nothing much in it, just a bed and the material to do his work. There wasn’t enough stuff around to call it “squalid.” The atmosphere was intense and focused, all business. Several large canvases he was working on filled the main room, and his meticulous pencil drawings were pinned to the walls. There were collages lying around that he used to develop the images for the paintings, cutup car ads that he reassembled according to his peculiar formal logic. I don’t know how long he’d been painting the cars, but it felt like he really knew what he was doing. When we first met, we spent a while feeling out each others’ tastes and attitudes. I could immediately recognize a fellow member of the Cult of Painting who appreciated a wide range of things. At one point I was trying to understand where he located his work, and he said he felt very close to Robert Ryman. I’ve remembered that, partly because it confirmed my sense of his work as a variant of abstraction, but also because I loved the perversity of Peter surrounded by his mutant automobiles, claiming that affinity. The “isms” his work seemed connected to weren’t ultimately that useful, but weren’t completely irrelevant either. The work certainly wasn’t Photorealism, although his method owed something to those artists and his source material was always photographic. It was too deadpan to be surrealism or dada, but there was a biomechanical quality reminiscent of aspects of Picabia and Duchamp. The connection to Ryman and Mangold was strong, but the car subjects drastically subverted any such reading. When I understood how deliberately he worked and how formally intuitive his decisions were, I thought of Myron Stout’s hermeticism and micromanagement, but joined to something garish and vulgar, much closer to an artist like James Rosenquist. Surprising connections and subverted readings: Peter’s paintings have an absolute specificity. Once I got it, I never thought of his work in terms of style. The entire surface is made—you can feel stiff oil paint being spread with brushes at every point. All the painterly decisions are labored over, and you can see it in the surface of the object. 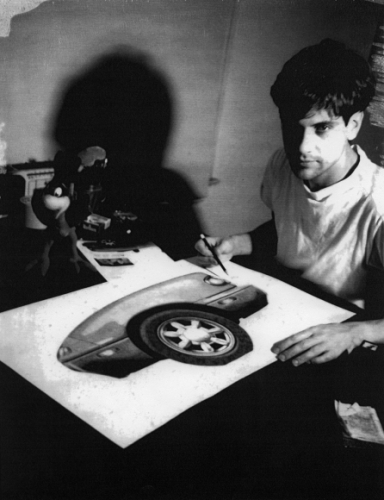 It’s too limiting to think of Peter as “the car painter,” but for most of his working life that’s what he was. While I would have been happy to continue seeing him as a rogue post—Minimalist, as he began to exhibit more, I realized you couldn’t deal seriously with his work without thinking about cars. A hundred years ago there were no cars on earth, and now look around. Who was consulted about this? Who voted? If you spend time driving, you get whiffs of Peter’s paintings constantly—the anonymous character in your rearview mirror, or the one you’re tailgating. Thinking about his work, I remembered how cars functioned in my childhood imagination. First the realization that a car’s front or rear could be a face, and that those sailing along the highway could be huge heads on wheels or aliens. Later there was an obsession with brands: going for family drives and pointing out Chevrolets, Fords, whatever, excited about being able to tell the difference. Peter’s work conflated these levels of thought into one demonic, unconsumable presence. Superficially Peter’s paintings resemble nothing so much as billboards of car advertisements, but devoid of their sunniness or idiotic libido. Everything is turned inward, toward thought and myth. They feel like “good design” run amok, with no human component. The cars balance on one wheel, they have no room for passengers, they hang upside down or race vertically up the edge of a painting. The fields around the cars define a place simultaneously cramped and streamlined, filled with a bright, ubiquitous light that seems to emanate from the cars themselves. Through 1995 Peter’s focus on the cars was almost complete, but there seemed to be action at the fuzzy edges of the project. Drawings appeared that were less labor-intensive, concerned with defining the images using a blunt, wobbly line. There was a group of small grisaille paintings of cars based more directly on straight photographs, which seemed to be a bit too close in feeling to Gerhard Richter’s Baader-Meinhof series. Now they can be seen as a transition, all grist for some future mill. At some point, the edges must have started to feel more like the middle to him. Less than a week after he died a poster arrived announcing an exhibition of his recent work. It showed a painting unlike anything he had made before. Clearly when he died he’d been having a growth spurt. Peter made three paintings and numerous drawings based on the same three images of his boyfriend Sean lying on the beach. They all show him from the side, close to his head, viewed from the level of the sand. The one on the poster has him lifting his head and looking out, at what? The waves, a fly on his foot, someone’s head in his lap? He has an urban-primitive haircut, long tail hanging from his head, goatee on his chin. The moles on his neck and shoulders are rendered with great care. The other images have Sean inverted. In one his face is abruptly cropped. In the other he’s laughing, but it’s hard to tell because he’s hanging vertically down like a slab of beef. The same formal considerations, fused with that careful, imploding paint that Peter had applied to the car subjects, had been brought into the most intimate realm. The process is subtly opened up—you feel a bit more direction in the surface, and the edges of objects have an ambiguous glare, like those of a cutout. Peter was finding a way to create an entirely new formal vocabulary for himself by painting hair, and profiles, and trees. It’s hard for me to get the goatee out of my mind, painted like a nest of little worms growing from Sean’s chin. These works have an almost domineering presence infused with a disconcertingly gentle, pillow-talk type of content. I can imagine artists as irreconcilable as Alan Turner and Georg Baselitz occupying some virtual chat room in Peter’s mind while he made these things. Something else was on his mind as well, leading to something perhaps riskier and not as immediately easy to see, a path into a more sociological space. When he died he had also finished four of a group of “landscape” paintings, and was at work on two more, based on his photographs of the facades and parking lots of gas stations and convenience stores. At first glance they play right into the hands of those who never stopped seeing him as a Photorealist, but then his “alterations” and “improvements” begin to creep forward. Chain stores are stripped of their logos; colors are changed, the type on signs is eliminated; things become more abstract and simultaneously yield up more of their essence, full of potential motion, waiting for something to happen. These environments, shaped for automobiles and people, are drained of both. The slightly loosened handling and hard, cold edges of the paintings of Sean are here too, giving the scenes a loopy sort of calm. Their flat, lonely narratives bring to mind Edward Hopper’s canvases, but emptied of people and turned into something nearly amusing. That Peter was willing to let his work take him so near to Hopper and certain of the Photorealists bespeaks his confidence. These are courageous paintings. With Peter’s death, I’ve never felt so aware of art history’s contingency on the actual. We don’t count what people think about or what they might have done, only what they do. The developments at the end, the opening up onto new trains of thought, leaves one feeling deprived of all the potential growth. Peter’s contribution stands as it is; I hope younger artists will know his work, and use it.